SanityCheck is an advanced rootkit and malware detection tool for Windows which thoroughly scans the system for threats and irregularities which indicate malware or rootkit behavior. By making use of special deep inventory techniques, SanityCheck free home edition detects hidden and spoofed processes, hidden threads, hidden drivers and a large number of hooks and hacks which are typically the work of rootkits and malware. 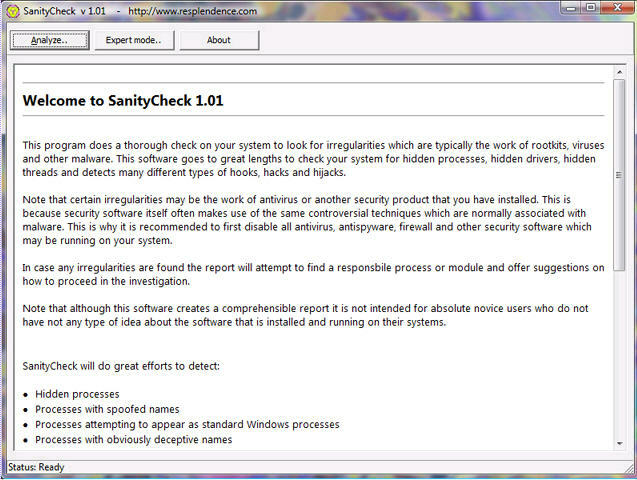 SanityCheck is an advanced rootkit and malware detection tool for Windows. ...... of any irregularities found and offers suggestions on how to solve or further investigate any situation. SanityCheck runs on most recent Windows versions including Windows XP, Windows Vista, Windows 2003 and 2008 Server. Unlike most other anti-rootkit software it also supports x64 editions of Windows. For an exact overview of the Windows versions supported by SanityCheck and the service packs required click here. Qweas is providing links to SanityCheck free home edition 2.02 as a courtesy, and makes no representations regarding SanityCheck free home edition or any other applications or any information related thereto. Any questions, complaints or claims regarding this application SanityCheck free home edition 2.02 must be directed to the appropriate software vendor. You may click the publisher link of SanityCheck free home edition on the top of this page to get more details about the vendor.